Massive news, Bring Me The Horizon fans!! The world’s favorite metalcore band have announced the release date of their upcoming album “amo,” to be January 2019, with an enormous world tour to accompany it!! 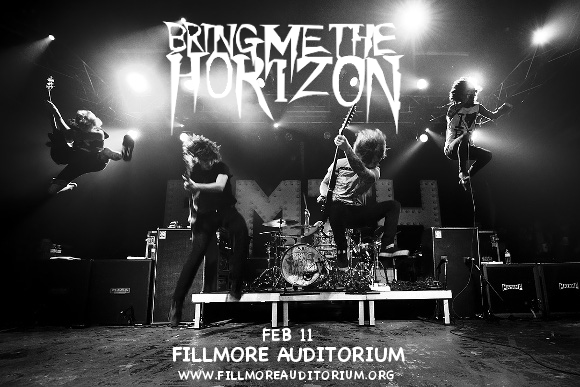 Don’t miss out – get your tickets to see Bring Me The Horizon LIVE at the Fillmore Auditorium on Monday 11th February 2019!! Currently consisting of vocalist Oliver Sykes, guitarist Lee Malia, bassist Matt Kean, drummer Matt Nicholls and keyboardist Jordan Fish, Bring Me The Horizon have been around since 2004 and are a firmly established force at the forefront of the alternative rock and metal scene, with a sound that developed from a deathcore style in their early days to one more metalcore-influenced as time went on. With there album “There Is a Hell, Believe Me, I've Seen It. There Is a Heaven, Let's Keep It a Secret,” the band shot to global prominence. We can hardly wait to hear it live – can you?? Tickets for this show won’t last – grab ‘em now and get ready for Bring Me The Horizon on February 11th! !